Without much thought, I started a puzzle on the day before Ash Wednesday. It’s a winter snow scene of Gethsemani, the monastic community best known for having Thomas Merton as a member, and a typical winter landscape of barren trees and grey. Lots and lots of grey, with the chapel centered among the snow and ice. I put most of the border together on the first day, less one piece that made me certain the puzzle had come defective. I found the one edge piece I was missing a week later, nestled among the 500 pieces less the ones that formed the border. Then I started with parts of the picture that seemed easily identifiable. These did not include the barren trees or what looked like 837 pieces of shades of grey and white snow. And through the days of Lent, I’d stop by my dining room table, half filled with papers and tax documents waiting for me to finish organizing them to take to my accountant and half filled with a puzzle that exists in various stages of incompleteness. Each day of Lent I’ve put a few new pieces in place, survey the entirety of the puzzle, then go off to whatever life holds for the next few hours. On rare occasion I’m able to sit down for a significant amount of time to piece together this puzzle. No matter the length of time, slowly, since Ash Wednesday, I’ve realized putting together this puzzle has been quite the Lenten discipline. Well-known preacher Joel Gregory says oftentimes, the best sermons find you. This Lent, I’m reminded the best Lenten disciplines find us, as well. God, spread across the dining room table in 500 pieces, nestled in my life in a brilliant Lenten discipline about life and faith. With each piece I’ve put in place, I’ve had time to ponder and reflect on all that is a life of faith, our ministries, and what lessons I always need to remember. So what has the puzzle of Lent put together for me? 1. 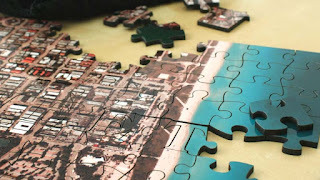 Find the boundaries– Maybe some people put puzzles together in another way, but for me, finding those border pieces creates a defined space for all the other pieces to come together in a full picture. Our human lives mirror that in an absurdly perfect way. We must define ourselves first to hold all the stuff that is us, the fullness of God in us, together. We can’t depend on other people to define our boundaries, because others are neither responsible for nor capable of defining other’s boundaries. We can't even depend on roles developed by others to define us. We must deeply know in our selves and souls we are beloved of God. In that love, I can fill in with all sorts of things. In that love, I recognize where I begin and someone else ends, and I'm not hoping something or someone will define me. But make no mistake, forming the boundary is work, lifetime work. But worthwhile and necessary work. 2. Sometimes the big picture helps, but don’t forget to notice the small details– I have a friend who loves puzzles. She puts together 10 million piece puzzles that are entirely one color for fun. And she thinks using the picture on the box is cheating. Me? I need to see the big picture to notice where the chapel windows are and which shade of grey I’m working with. And I need to notice the small details – the different types of barren tree branches, for example. As a minister, my life involves knowing the big picture things, the rules, we might say, of pastoral care, of church leadership, of preaching, and of liturgy. But the nuance of knowing the person with whom I’m sitting in grief, the history of the church I’m helping lead, the congregation to whom I’m preaching, and the deep, rich ages of ages story of the liturgy that holds us together helps me see the important detail of the big picture. Too often I see ministers of all types (lay and ordained) frustrated because the approach they learned in seminary falls flat with a certain pastoral situation or the authority they wield in one area of life with success does damage (or at least makes people really aggravated) in another area. Human relationships with each other and with God have some commonalities, and they are not always subject to a neat and tidy checklist. Know the rules and guidelines, and be wise, courageous, and stupidly faithful enough to know when to break them. That only happens because we see the vastness and the minute parts of it all. 3. Do the easy parts first– Really, I’m not too proud to say life in faith is a marathon that can leave us weary. And I’m reminded, before I launch into the meetings that will be challenging, into the pastoral situations that will bend and break my heart, to do the easy parts first in my day or my week. Here’s where I get in my pulpit and say the easy part is almost always prayer. Not easy in that "comfortable and always fun" way, but easy in that my body knows when I light the candle and take three deep breaths, silently saying The Jesus Prayer, my soul knows exactly what to do because I've done this prayer for decades (inching into quarter century time). 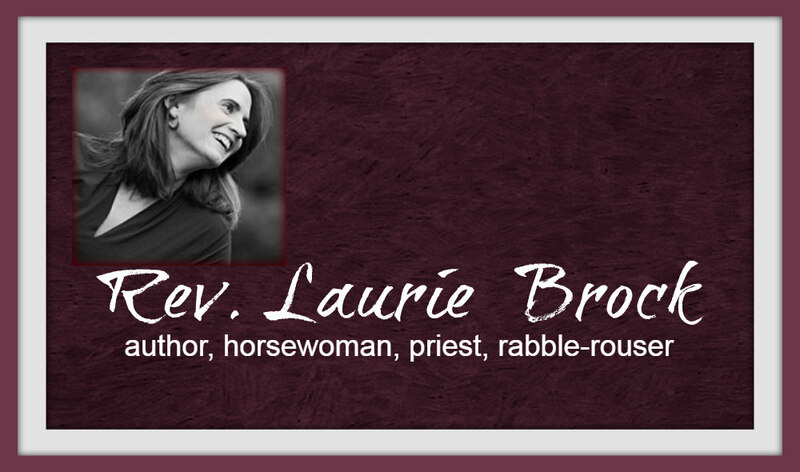 And, thanks to Brother Lawrence, I also know how to find the easy things as I practice the presence of God. When you see your pastor or congregation leader doing something that seems to be not their job, they might be doing something easy because sometimes (lots of times) we have to face uneasy, difficult, and arduous tasks. Folding bulletins, cleaning the silver, arranging the chairs for Sunday – they are the easy parts we can do in prayerfulness to ready ourselves for the harder tasks that await. 4. Sometimes you simply have to try the pieces until you find one that fits– God knows we all want success right out of the gate, and yet, that’s rarely the way faith works. As I’ve filled in the easier parts of the puzzle, eventually I’m left with the pieces that are all one color, and there’s one way I’m putting them together: I'm going to try a piece in differing places until it fits. Trying different options and approaches until we find one that fits is tedious. tiresome work. We often will opt for something that almost fits and force it. In a puzzle, that throws the whole puzzle off, and I suspect it does the same thing in our lives. Faith is fabulous, and faith is tedious. When it’s tedious, keep working, because eventually something drops into place. 5. Time gives us vision – I know people who would sit down and do this puzzle in a few days, even hours. I’m easing in to the fullness of Lent to put it together. And this is the valuable lesson God has pieced together for me (more of a reminder than a new lesson, but still) – time gives me vision. I may fit a few pieces together, then hit a wall and walk away because life is waiting and the microwave let me know lunch is ready. And then I come back the next day while I’m waiting for the kettle to boil and, without any effort, immediately see the way other pieces fit together. Our absence from a task is as important as our focused presence on it. God works in the fullness of time, even (and I’d even say especially) in the waiting of it, in the moments we’re away from focused attention. We go on with our daily activities, then return to a situation, a prayer, our discernment, and realize we’ve given God enough space to give us a new vision, some new insight, even the ability to hear the new thing God wants to tell us. Ministry is as much allowing things to unfold in their due season as it is working and planning. If we try to control all of faith and ministry, we’ve also controlled God right out of the equation. I’m down to about 40 more pieces. They are all the same color, so I very well may slide in just under the line of the Saturday before Palm Sunday to get this put together before Holy Week begins. And when I do, I’ll take a photo of the whole puzzle, put together, and leave it on the table for Holy Week, giving thanks for the lessons God reminded me about life in ministry and life in faith through 500 pieces. Then I’ll disassemble it, put it back in the box (hopefully without losing any pieces). And on Easter Monday, I’ll begin this 1000 piece puzzle I purchase when I visited the Grand Canyon. Because the lessons from God never end. I love the liturgy of the Episcopal Church because in it, I am reminded who I am and who God calls me to be. I am reminded faith is not all about me or my preferences or opinions or thoughts or ideas, but a part, a God still counts the hairs on my head part, but indeed, still a part, of eons of humanity’s experiences with God and their response in those experiences. I am reminded of humility, that the prayers of thousands of years invite me into a wisdom and insight I could never experience on my own. 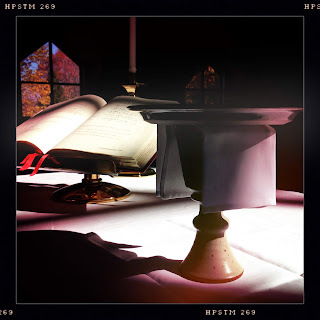 I am reminded I love the liturgy of the Episcopal Church, and that love does not need to discount or disregard other expressions of worship in other denominations or even in other Episcopal churches. In fact, if I do that, I am missing the point of liturgy. The liturgies of the Episcopal Church are offerings for the good and ways to remind us of the goodness of God, the creation, and our place in it. When I officiate at a Baptism, I am part of the gathering of God’s people who witness the courage of the one being baptized (or their parents) to say to the world, “We believe in God, Jesus, and the Holy Spirit and we will follow the way of love!” in a culture that too often demands we follow the way of fear and self-interest. When I celebrate the Holy Eucharist, I am present with Christ in a way that words simply cannot describe, even for a writer. Every part of the liturgy engages me. The Eucharistic prayers, those I adore and those I pray because I vow obedience to the doctrine and discipline of the Episcopal Church, all narrate the great act of Christ’s love and ask us – yes us, we untidy, odd humans – to participate in that act with Jesus! The feelings of the items on the altar - the sharp, starched crease of the corporal, the weight of the chalice filled with wine to be consecrated, the hosts, even the two or three rogue ones that eternally escape the edge of the paten, and the voices of the people gathered proclaiming, “Christ has died, Christ is risen, Christ will come again” all stop time and space as we pause at the moment between God’s inhaling before the great exhale of the Spirit that brings created and re-created life in a new way. Even when I've listened the the Eucharistic Prayers prayed in a language other than English, I know them and hear them with my self and soul. The words of the Eucharist, in their great mystery and truth, are bigger than one language or expression. We gather in that eternity in all the messiness of our diverse humanity to receive the Body and Blood of Christ and remind ourselves who and whose we are. And that is good. Or when I officiate a burial. Grief, while painful, is a reminder we had the courage to love and we have faith that our love does not die at death, but is changed into eternity with God. And every prayer of that service embraces love and grief together in the great narrative of faith. I have yet to say the words “yet even at the grave we make our song: Alleluia, alleluia, alleluia” of the prayer at the Commendation without feeling that physical presence of grief and love that surfaces with a catch in my words. Every time. Those words are the vocabulary of grief and hope bound together in the community of saints, and I love them for bearing that truth. And the Daily Office, that (as once described by a seminary professor) old warhorse of the Book of Common Prayer. I have prayed those words in fear and trepidation, in exhaustion and anger, in celebration, and in ennui. They find me wherever I am, and remind me of God, of the simplicity and the complexity of love. I have prayed the Office in Westminster Abbey and at my dining room table over coffee, in the Tomb of the Holy Sepulchre and in the graveyard at Gethsemani Monastery, on my front porch after the devastation of Katrina when the humidity caused large drops of sweat to drop onto the page and on the beach with friends when the wind was icy and blustery, but we were determined to say the Magnificat together that evening. Those words have been my holy companion for decades. Wherever I am, the liturgy of God finds me and brings me back to myself and to God. I love the liturgy of the Episcopal Church because I have surrendered to its words of love, its words of Good News. They find me scattered and smothered and meet me there in prayers I have prayed them for so long they seep forth from my heart. God in the liturgy lavishes me with the prayers of thousands of years of the people of God, reminding me of the great cloud of witnesses that prays with me, with us. In our liturgy, we pray with each other, for each other, in the company of all our thoughts and emotions. We pray with God, who has given us the work of goodness. Decades ago, which unsettles me somewhat that seminary is that far in my past, my spiritual director and I sat in silence before we began to speak about all things stirring in my soul during Advent. For me in seminary, this meant final papers, exams, travel plans, an upcoming meeting with my bishop, and responsibilities in our seminary chapel as well as the church where I served. I had much to tell her. And yet, when I walked in and sat down, after our initial greeting, she invited me to wait with her in silence before either of us said anything else. My busy soul did not want to wait. The first few moments were filled with itchy irritation, an urgency swirled inside of me that wanted desperately to speak NOW, as if my words had a shelf life. But she was my spiritual director and a nun, and few things snap me into obedience like the holy sisters of our faith. Waiting in silence. We were in the presence of each other and our souls for what seemed like hours. Slowly, the urgency of my words unknotted in the space. I felt my shoulders drop several inches. My emotions of the day and the week and of the time since we last spoke began to order themselves into discernible feelings instead of the one that took up the most space in my soul because it shouted the loudest. Only then, after the air in the space between us leveled, the mountains of urgency brought down and the valleys of the things I really needed to speak of were lifted up, did we begin with words of prayer. And in that one moment, I realized one of the vital messages, the deeply crucial lessons of Advent. We humans need to practice waiting. But we don’t. We live in a world of instant opportunities to comment, to like, and to share. When we send text messages or emails, we expect an immediate response. We want next-day delivery from books we order online and from God when we engage in deep discernment. And when it doesn’t come, we become like a three year old who has had too much sugar and too little sleep. Waiting gives us space and time to hear the voice of God in the cacophony of our lives. When we are grieving, anxious, or angry, all the voices are yelling at once so we hear only the loudest (which is almost always not the one we need to heed) or the noise combines into silence and we have no idea what to do. We react with only impulse and without holy wisdom. Waiting is that moment when we can’t remember the name of someone or a book title in the moment, usually because we’re distracted or our brains are working overtime, and in the quietness of washing the dishes or watering or plants, it comes to us. We recognize what we need to know, what we need to be aware of, or even what we need to remember because we wait. When we wait, we remind ourselves that some moments and events in our lives demand we give our selves and souls time to unknot, to breathe deeply and to listen to the voice of God leading us almost always on a path we likely don’t want to walk. Pastors and therapists often advise people to wait for some time after the death of a loved one before making momentous decisions, if circumstances allow. Rebound relationships after a divorce or ending of a relationship are cautioned against because they don’t allow for waiting, and often cut the wound in our souls even more…or allow us a continued way to ignore unhelpful patterns in our own lives. A rabbi friend of mine, while we were co-leading a retreat on anger, suggested we allow three days before responding to something that made us angry to give God time to sort our emotions, a bit of wisdom that has helped me many times and, when I’ve ignored it, I almost always find myself wishing I hadn’t. He remarked that if, after three days, we were still angry at the situation or person, we could then ask God to reveal how to move forward with the process of repentance with kindness and love. But often, he added, in three days, we might realize we are really angry with something else and the situation or person triggered us. Waiting with God offers a way for us to begin to understand what we are ignoring in our own lives and what we need to focus on without the damage our actions and words in haste may add to the situation. Waiting gives us that space to enter the wisdom of our unconscious as almost nothing else can. Waiting is deeply open-ended. When I consciously engage in waiting, whether it be waiting to respond to an email that feels wounding to me or engaging in prolonged discernment with God, I have ceded control of a situation. I have consciously, although not always happily, acknowledged that my first response or my hundredth response may not be helpful or loving. I may have to hear a holy No or a holy Yes or a change of plans. But only waiting for what may come will offer this insight. Waiting is scary. Humans have an innate fear of the unknown, and waiting, being the open-ended act of faith it is, plunges right into the unknown with God. The unknown with God is oftentimes scary and fearful. Anger is almost always fear’s bodyguard, so when I feel anger take all the air in my soul by yelling the loudest, God almost always reminds me to wait and pray while anger sorts herself out into what I’m angry about because something is wrong and hurtful and what I’m angry about because I’m afraid. Waiting is a profound act of humility. When we sit, waiting to renew our car tag, how many of us are annoyed because we have other things to do that we deem more important without regard to the people working at the desks and their circumstances or stories? How often are we mad that the schedule doesn't fit OUR timeline? Waiting invites us to crawl our of our own skins, our own experiences, and our own egos that whisper words of temptation making our schedules, needs, and time so much more valuable that others. Waiting reminds us, in a deeply grounded way, that life is not all about us. We are part of a larger creation, and all creation waits. God is a God of eons. God is not a fan of instant gratification. Instead, the people of faith wait for miraculous births and wander for forty years as they are shaped into the people of God. We Christians wait for three days to see if Jesus will be resurrected. Waiting, in only the way waiting can, puts us in our human place to allow our souls to wait for the guidance of the Lord. Advent is a season the church dedicates to waiting, to being courageous enough not to react instantly, but to sit and let the crashing waves of our souls still in the presence of God. This Advent, find time and space to wait, in open-ended, courageous, and humble faith. The following is a review of Denial Is My Spiritual Practice by Rachel G. Hackenberg and Martha Spong. I received a complimentary copy of the book to review. Last May. And I'm thankful their book reminded me imperfection is okay. Women of deep, messy faith get married. And then they get divorced. And then they get married again and divorced again. Or not. They live with depression and PTSD and all sorts of illnesses that remind them and us we often collapse under the weight of things done to us and left undone to us and sometimes, many times, for no discernible reason at all. Because mental health matters are not signs of weakness or sin or bad living. They are part of life. Women of deep faith have moments of beautiful, lyrical poetry and prayers and sometimes just sit in the fear and frailty of all that is life and realize they are one stolen truck shy of a country song. Women of deep faith hate walking labyrinths but love the peaceful elixir that is a Starbucks chai latte. Women of deep faith fall in love with people and are often surprised by that love and scared of sharing the joy of this love with their family members. They also would like to be surprised by love and a bouquet of flowers but realize the energy of cleaning the house for the flowers would just be too much, so single life is good. In a world of books that tell women to wash our faces and simply live our best lives and love Jesus and all will be AMAZING, I am thankful for the messy, vulnerable, hilarious, and often painfully honest of the words Rachel Hackenberg and Martha Spong share in their book Denial Is My Spiritual Practice (And Other Failures of Faith). In essay pairings, they write of their faith that is less sure and certain and more stumbling, running, crawling, and on occasion traumatizing. While the exact fact situations may not resonate (although my guess is in our darkened closets more of us have been victims of abusers, struggled with parenting, and questioned our assumptions about sexuality than not), the emotions will resonate. Their deft narratives of love, hate, fear, fragility, gratitude, doubt, frustration, joy, and more love are excellent reflections for any person of faith who needs to hear the words of God that life is hard, hurtful, and messy and is glorious, joyful, and loving and all of these are necessary. I deeply appreciate that neither Martha nor Rachel felt compelled to end the essays with tidy resolution. A few find their way to a sort-of ending, but most invite us to reflect, to feel unsettled, and to allow their words to start a conversation in our own souls. Full and fair disclosure - I received this book early this summer to review, but life is messy and plans fall to the side and I finally got around to reading and re-reading this book now. And I think it’s a wonderful book for Advent. As we sit in the ever-growing darkness of the natural world and sometimes feel like love’s grip on the world is failing, find a moment. Light a candle and breathe a bit. Really breathe, like wear yoga pants so nothing constricts you breathe. Then read some of the essays. Sit with the feelings they release in you. Remember your own life stories. Maybe read this book a part of a small group and listen to the stories these words birth from one another. And remember all the stories, the ones from these two women of faith, from the people who read these words, and the stories of our own lives, the ones we shout from the mountains and the ones we keep buried deeply in the boxes of our souls…all these stories…are held in love. And then end your time with Rachel’s amazing version of I Corinthians 13.